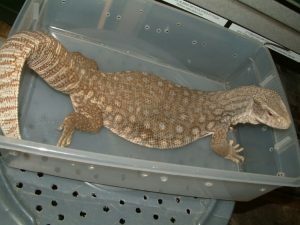 Savannah monitors are medium sized lizards found in Africa. They’re also known as savannah monitor lizard and Bosc’s monitor, the latter more predominant in Europe, as it was first described by Louis Bosc, a Frenchman. Size: A full grown savannah monitor can reach a maximum length of 3.5-5.0 ft (105-155 cm). Weight: They weigh between 11 to 13 lbs. Color: The base color of the body ranges from light yellow to grey. There are light yellow marks on the head and circular dark-edged yellow spots on the back arranged in symmetrical rows. The ventral portion and inside of the limbs are a yellowish-grey to brown. There are alternating rings of yellowish and brown on the tail. The forked-tongue is blue. They can be found across Sub-Saharan Africa and also in the central and western parts of the continent, extending south into the Congo River. Savannah is the most preferred habitat of this reptile. They also live in open forests, woodlands, and desert-type areas. 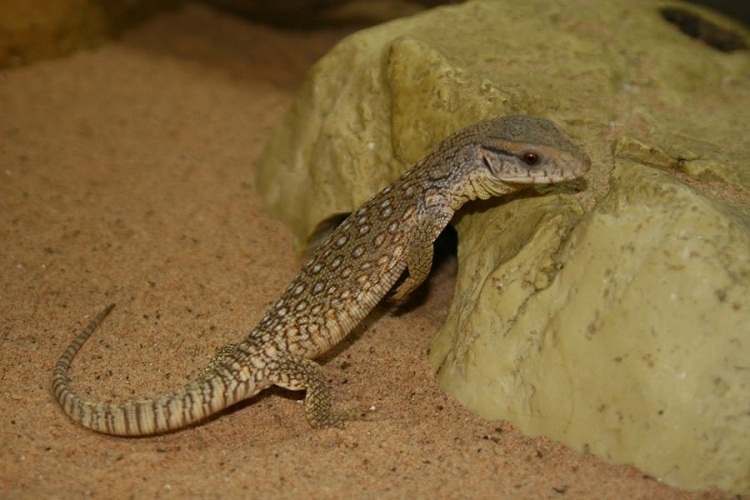 They primarily live on the ground and use burrows as shelters. Sometimes they can be found in low trees and bushes. They are rather territorial, and encounters between two males are followed by threats made to each other in a bid to intimidate the other. Sometimes they get into duels and start wrestling during which their bodies become intertwined and their bites can cause severe damage on the other. A cornered savannah monitor hisses loudly and strikes the ground with its tail to ward off the predator. If nothing else works they play dead. They are at their most active during the daytime. Their feeding style is based on a feast or fast system. 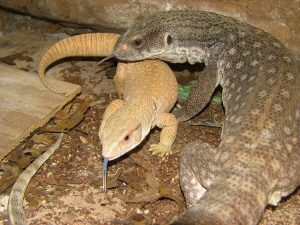 The wet season brings an abundance of food, and savannah monitors take full advantage while during the dry season they survive off the fat reserves accumulated during the wet season. 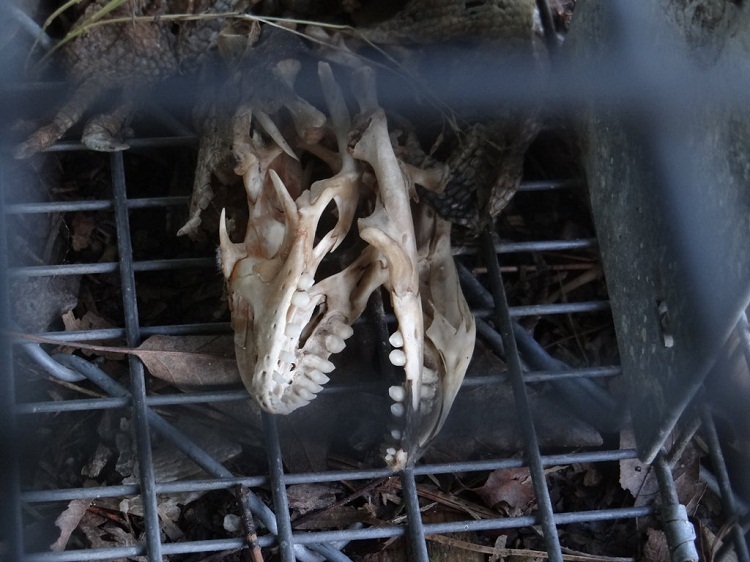 They consume toads, snakes, small mammals, birds, lizards, and eggs. Snails form a significant part of their diet. 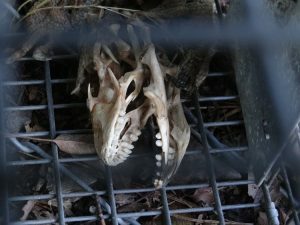 Juveniles are, however, primarily insectivores. 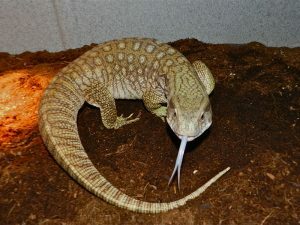 The rate of flicks of their tongue increases from 20 per minute up to 80 per minute after they have bitten a prey. This helps them to locate the injured prey. The mating season for savannah monitors coincides with the above-mentioned wet season when there is no food shortage. A male follows after a female in a relentless manner, occasionally scratching her or biting her neck. The female eventually gives in and the two mate. Copulation usually lasts for a few hours. 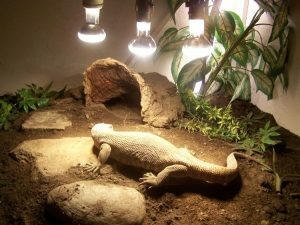 Four weeks later the female lays between 20 and 50 eggs in a nest she builds from scratch. She may also use a termite mound. The hatch rate for the eggs is exceptionally high at 100%. The incubation period lasts for five to six months. The offspring grow rapidly in the first two months of their life. 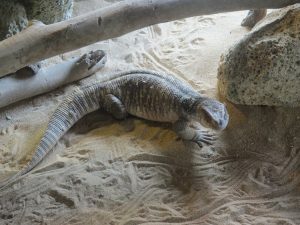 They eventually reach sexual maturity at 1.5-2 years of age. They live for around 13 years in captivity. Life expectancy in the wild is lower. They are usually quite. Hissing is a sound they make to warn and ward off predators. They also communicate through chemical means. Adult savannah monitors have blunt teeth which they use to crack open snail shells. The jaw also helps in this regard as most of the leverage is put at the back of the jaw which further aids in crushing snails. The forked-tongue acts as a tool they use to understand their environment by tasting the air. Every flick of the tongue sends information through their tongue to the brain. Since poisonous millipedes form a major part of their diet, they have developed a tactic to avoid the poison wherein they rub their chin on the millipede for close to and often up to 15 minutes before consuming it. 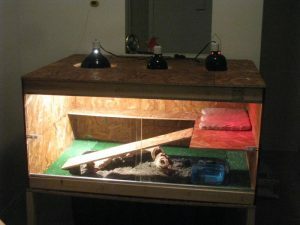 This helps them avoid the unsavory fluid the millipede secretes when attacked. 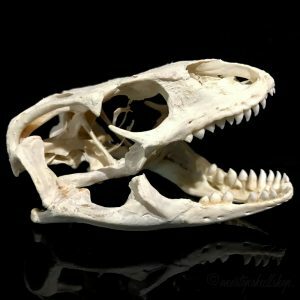 Some snakes and birds may prey on these reptiles. 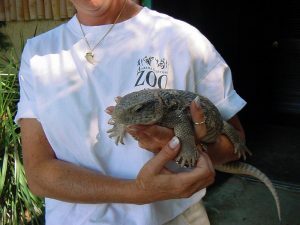 Savannah monitors are popular pets due to their docile temperament. 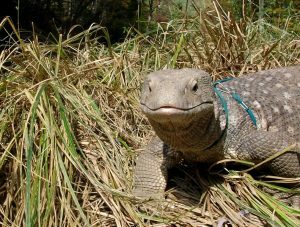 They do have to be given a housing which closely resembles their native habitat. They also need to be cared for to maintain good health and avoid aggressive behavior. 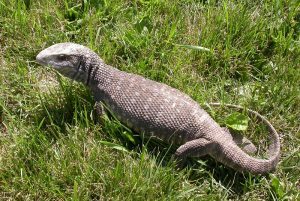 The IUCN lists the savannah monitor under the ‘Least Concern’ category. 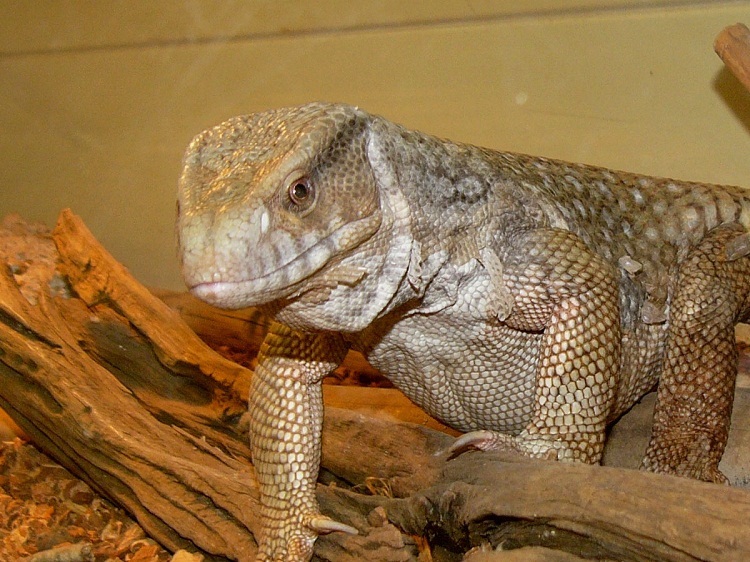 The savannah monitor shares its subgenus with the Nile monitor and ornate monitor. 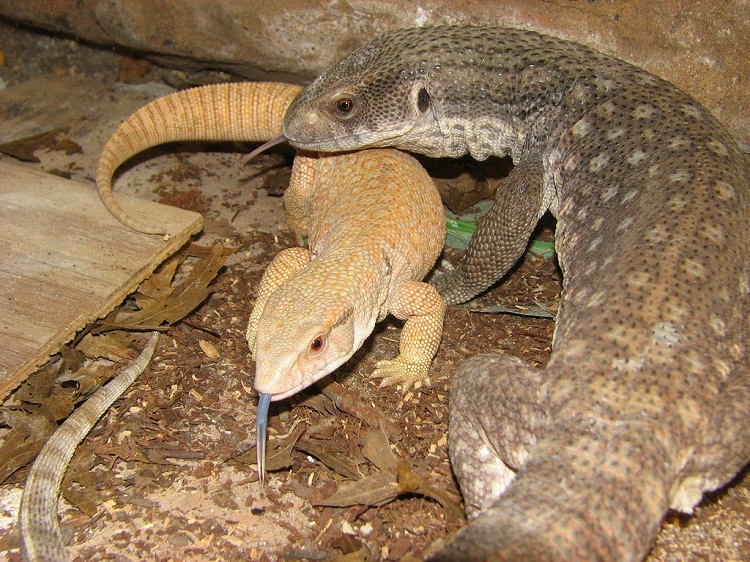 The white-throated and the savannah monitor were considered the same until 1989.